Location: “Yovchevata house” complex is located in Kilazhevtsi neighbourhood, just 3 km away from Elena town, along the road to Sliven. The complex is located in the picturesque neighbourhood Kilazhevtsi, huddled at the foot of the Balkan mountain range, surrounded by a cheerfully bubbling river. The complex offers ethno restaurant “The old oak”, horseback riding ground, organic garden and a bio farm. 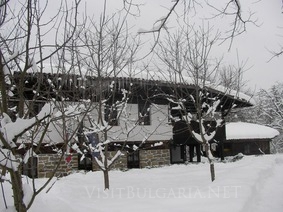 Accommodation: The “Yovchevata house” complex offers rural, ethno and eco tourism. The complex offers three renovated traditional houses. Yovchevata house, Baba Dana house and the Doctor's house offers a total number of 30 beds in 10 cosy rooms and 2 apartments. All rooms are furnished in the traditional revival period style. Each house offers individual veranda, mehana and fully fitted kitchen, satellite TV and wireless internet. The houses are heated by local heating system and the warmth and comfort is guaranteed even during the coldest winter days. The main house offers a traditional mehana for 30 guests and a summer kitchen with a barbecue and an open air oven. The complex offers additional services like preparing traditional dishes upon preliminary demand, laundry, room service. Pets and horses are also allowed in the complex. Wine & dine: The mehana in the complex is decorated in a traditional style and offers delicious specialties. You can feel the warmth of the homemade wine and rakia.